The last book I read by Martha Peace was The Excellent Wife . I confess to reading that one a long time before I was married, so I could probably stand to read it again. I did, however, remember liking the book and it still sits on my shelf. 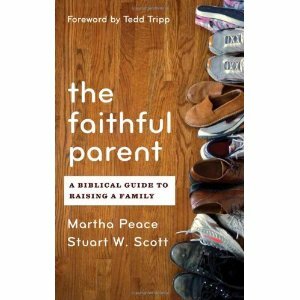 I was pretty excited to see that she was putting out a book on parenting and so with eager anticipation I dived into The Faithful Parent : A Biblical Guide to Raising a Family. The book has some good points and some bad points. We both agreed and disagreed with various things the authors of this book said. So instead of writing up a review in the manner I typically would, I'll just give you the books pros and cons. Authors Peace and Scott lay out their arguments in a simplistic and straight forward manner. It is easy to understand their advice and opinions. I would say that if you are a first-time parent (or really feel like you don't have a clue what you are doing as a parent!) then they offer a lot of practical advice. For example: "When your child does X, respond this way." It's extremely practical and explanatory. The authors take you through the various stages of childhood in this book, from infancy to adolescence, explaining how a child's thought process and behaviors differ from stage to stage. As Jonathan points out, the authors come across as hand holders to the parents reading this book. I'm going to point out the fact that both Jonathan and I are both firstborns and we're pretty good about digesting information and applying things to our lives. The authors felt somewhat condescending to the both of us. On the flip side of this, you might consider the authors practical, which is why I also include their communication style a pro. I think there are folks who would not be bothered by the tone of this book. To us, the "suggested discipline" methods came across as handing us a script (i.e., "When your child does X, say this.") Thanks. I think I can figure that out myself. But our biggest, hugest qualm with this book is the way that the authors view salvation and children. If you are fond of covenant theology this book will drive you nuts! Peace and Stuart are not convinced that children can truly ask Jesus into their heart/become a Christian/accept salvation (whatever term you want to use.) To them, this is a big mystery and in their scripted responses to children's behavior at various stages of the game, they raise question marks as to the child's covenantal status. Ladies and gentlemen, I barely know what to say to that. It takes my breath away. Jesus called (Luke 18:16; Matt. 10:14-16; Matt. 19:14) the little children to Him and didn't make them wonder over His love. God is faithful to generations of believers and all who put their trust in Him are a part of His covenental family (Gen. 17:1-8; Rom. 4:13, 16-17.) The Bible is filled with examples of the treasure, blessing and love of children and God's faithfulness to descendants of the faithful (Ps. 103:17). "If you confess with your mouth that Jesus is Lord and believe in your heart that God raised Him from the dead, you will be saved." I cannot fathom spending my children's lives making them play guessing games as to whether their belief is real or not. As parents, if a child expresses beliefs that we know to be true, we should encourage and reinforce them. If a child sometimes expresses beliefs that we know to be false (happens occasionally around here with an imaginative 3-year-old!) it's our responsibly to graciously do what we can to reorient their thinking. But we should never try to second-guess them ("You don't really believe that...") or condescendingly suggest that they're not old enough to know their own minds. If, as the authors imply, you communicate to your children something along the lines of, "Let's wait and see how things go after you experience a bit of real life, and then we'll know if you truly believe or not," you are creating unnecessary fears and doubts and offering a valid argument for your children to end up believing in a works-based salvation. It is with boldness and confidence that we are to express our faith - not with uncertainty! I am frankly appalled by this aspect of the book, and the authors weave this "wait-and-see" message about children's salvation throughout the book. I disagree with that theology point-blank and therefore cannot and would not voluntarily hand over this book to people without this disclaimer. If you want practical parenting advice, or if you are a newbie, then I think they offer some randomly good advice worth some consideration. They certainly have some fine points to make. On the other hand, the theology of the book is just criminal and I have a hard time with it as a result. As you might surmise here, the cons definitely sway me and my opinion of the book and therefore normally I would have just decided not to review it. However, I've mentioned that I was planning on reading it a few times and some of you said you were interested in learning more about it so here you have it. It can be helpful and practical, yes. And, at the same time, quite awful! I do appreciate P&R Publishing giving me the opportunity to read this book as I'm glad to know of it. Wow. That theology is just.....wow. I can see being uncertain as to a child's salvation -- one thing I struggled with was that I knew I could sit down with my kids at a very young age, after their having been in church since early on and heard the gospel at home, and ask them if they wanted to receive Jesus, and get all the right answers to questions, and yet have them say yes and pray to please me rather than out of genuine conviction. We've seen so many young people in churches wrestle with assurance that I wanted to try to avoid this with them as much as possible, and yet we did want them to be saved at the earliest possible time, too. On the other hand, we've known others who were model Christian children until they got to young adulthood, and then they turned their back on all they had learned and went off totally into the world. We wanted to avoid that, too. I prayed for much wisdom with my children in this area especially. But I would never handle it the way these authors did. It seems like it would unnecessarily put questions in a child's mind, and, as you said, leans more towards a works-based assurance. Thanks so much for this review. I've loved any Martha Peace books I've read, and The Excellent Wife is truly a favorite, especially for her explanation of Put Off/Put On. But, I was so surprised to read their wavering comments regarding children and salvation. You're right....it is criminal, and what harm we do to our children by planting such seeds of doubt (I'm not addressing the exhortation to us all to examine ourselves regularly). Wild. I'm not entirely convinced by covenant theology--but even so, I find little value in causing children to doubt their salvation. I have several siblings who "prayed a prayer" early on in life and who have since stated that they don't really believe they came to faith until much later. Sometimes I struggle with that idea because, while my own faith has certainly grown as I have grown, I don't believe that invalidates my simple, relatively uninformed childhood faith. Yet who am I to know whether my siblings' childhood faith was true faith or not? My question regarding Peace and Scott's approach is what possible usefulness do they think this approach has? If a child truly believes, all this will do is sow doubts. If a child doesn't believe, do they really think that this approach will somehow help the child to believe? Would it not be better to avoid making value judgments about a child's faith (since God is truly the only one who knows whether faith is sincere) and instead to model true faith (based on knowledge) to your children? The thing about salvation didn't bother me. I'm from a Reformed Baptist background. So I believe in election. It is God who saves. Praying "the prayer" doesn't mean anything. The majority of kids that I went to school with prayed the prayer, it's shocking how few of them turned out to be true believers. Phil 2 :12 does say to work out your salvation in fear and trembling recognizing that God is at work in you. I think the problem with kids and salvation is that they think (like some adults) that salvation is something that they do, rather than what God does. I personally would not allow my child to go for membership or the like until they were in their late teens. Wow is right... This just sounds horrible to me considering all the years I spent - until I was in college probably - wondering if I really was "saved" when I was 4 as I distinctly remember. I can't imagine what I would have thought if my mother had always been saying things like that to me. We are all still prone to sin so to base whether or not you are saved on your actions entirely... gosh, how awful! I'm not a parent, so what do I know. :) But I would never second guess my children and their beliefs like that. Why make things more difficult for them? I struggle with the whole faith vs/and works issue and wondering if I am saved (leftovers from a legalistic upbringing). So why would I make my children question their salvation when the Bible is so clear?